There are moments in life that are not explainable. So how can we express the feelings in those moments? 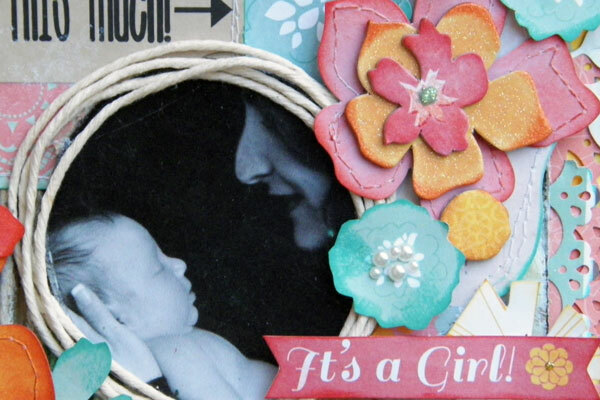 Most of the time it is best expressed through the sweet pictures that capture those moments. The new Baby Bump collection is themed perfectly for those pregnancy pictures or those first few moments with a new baby! With the soft corals, pinks, blues, and yellow you will be sure to find the perfect photos. 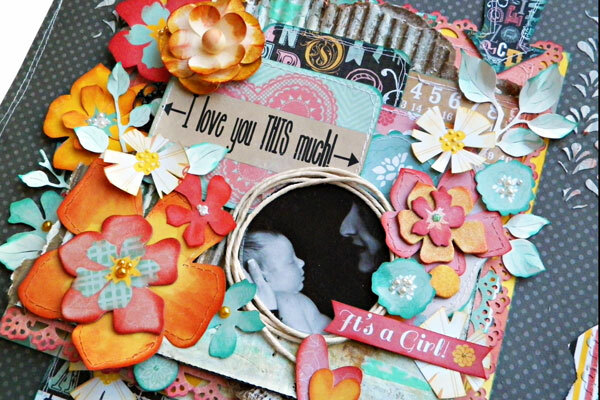 This beautiful "Baby Bump" collection is just perfect to scrap your pregnancy photos or those baby first year photos! I love the vibrant colors and fun graphics. 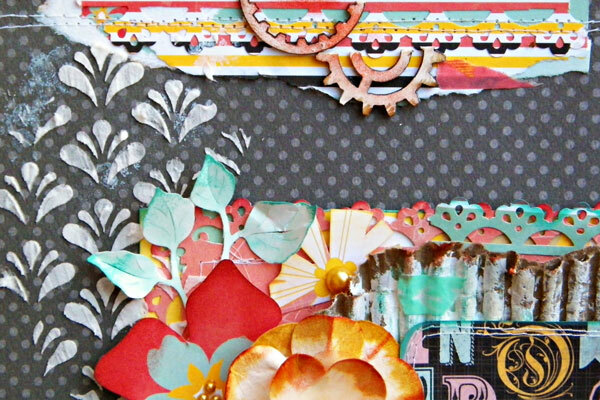 If you enjoy fussy cutting you will find the florals on these pattern papers to be a joy to cut and add to your pages. 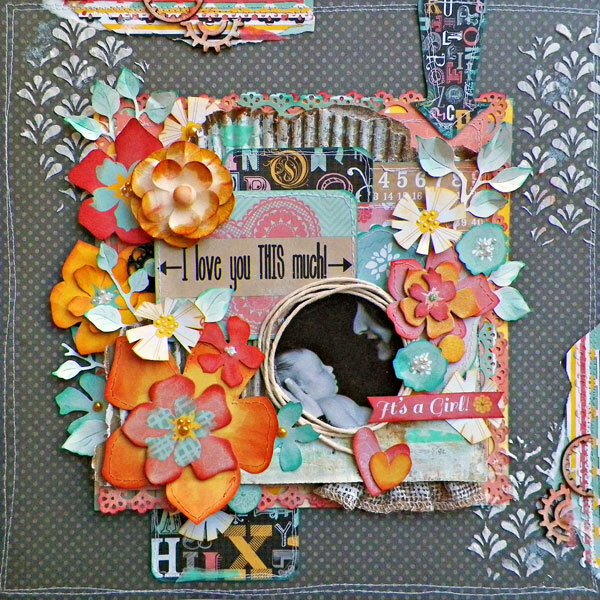 I wanted to create something a little mixed media yet sweet and feminine. I mixed the rough texture of cardboard with the florals, leaves, and added touches of stitching on all the paper embellishments. BoBunny has some stunning new washi tapes and here I have torn tiny pieces and added them to my edges. I finished my page off with some modeling paste and wood gear embellishments. As a photographer I have had the opportunity to do a few maternity sessions. The Baby Bump Collection gave me the perfect opportunity to showcase it's beauty using one of the photo's from my portfolio. I love the wonderful fun colors in the collection and wanted to create some flowers using the paper from the collection. The paper I chose gave the rosettes a water color effect. I topped each flower with a jewel. I also created some rolled roses and used some of the flowers from the noteworthy pack. The 6x6 Paper Pad is perfect for using the pages to create photo mats.I cut and inked one, and left the other 6x6 and offset the papers to mat the photo. I used a piece of Washi Tape to hold down a corner of the mat, then added some buttons along the side. I simply adore the little banner pieces that spelled BABY. I strung some jute through the pieces to create my banner. Thank you for the work you have put into your nice blog Cccam Server. We will bookmark to your blog because it is very informational. We love the site and will come back to see your new posts. These are just beautiful pages. I love how the ladies showcased this collection. Wow, you both rocked this collection! Such stunning lay-outs!